Happy sunday to everybody! I just woke up this morning in our super cozy little Los Angeles house, ready for another warm day in the city of angels. I’ve been kept extremely busy with my project, so much that I’ve barely found time to Instagram as much as I usually do. But, I know how much it’s so incredibly worth it… I’ve been hibernating in house with the team, working day and night, reaching for our biggest dreams. I feel like things are really going to change in the next couple of months… and I am so ready for it. What we are working on right now, is probably the biggest project I’ve ever lead in my life. I feel like I am getting completely out of my comfort zone and that’s what gets me the most excited. I am getting into something new, but something I’ve always been dreaming about. I don’t want to settle down with some of the achievements we managed to muscle, instead I want to acknowledge my passions and push the boundaries, push them together. And never be afraid to fight and pursue a dream that I had since I was born… I would regret it all my life. And that’s actually another reason why I am so happy to share with you guys today the second part of our collaboration with Rita & Zia around their new “CHAOS” jewelry collection, in stores now. It’s all about embracing your wilder side, letting yourself go to love, to dream, to be yourself, to be creative and to think outside the box. It’s the acceptance of Chaos being a natural, and beautiful element of life that we all have to learn to live with and to embrace. It was so interesting for me to explore this new look, more punk, more wild and free. It was so much fun, I almost felt like I was playing somehow a new character. I of course had to add in my little touch of chic with the burgundy lips and sleek line of eye liner. I love how the jewelry stands out. It was all about stacking it up, mixing everything together without any rules. Because that’s what fashion is about, it’s all about having pleasure and feeling as free as possible to express ourselves and to create what truly affects us. Wow, really outstanding pictures! You are super comprehensive on your articles, I really like it! How cool is this! The photos are amazing! I think it's always good and a wonderful possibility to grow personally if getting out of the comfort zone. You look wonderful love such kind of shirts! Fantastic and strong shots! Great jewelry and look! And, good luck with your project! I love this look on you so much! The jewellery pieces really top off the outfit. Wow stunning pics! Love the rings and the bracelet a lot! You look completely gorgeous in this pictures! I'm so excited for you and all of your upcoming projects! these pictures are stunning! I love your creativity with your posts! Love the bangles! They are very outstanding and perfect for mix and match with an outfit to create an edgy touch! Absolutely love the bracelet with the circular pendant! It's the perfect mix of chic and punk without being a chunky piece! Bravo!! Outstanding photos and amazing presentation of this superb jewellery! Great photoshoot! Love the wild look! Beautiful jewelry! Your photos are amazing! Wow these photos are incredible, you look absolutely amazing and gorgeous. 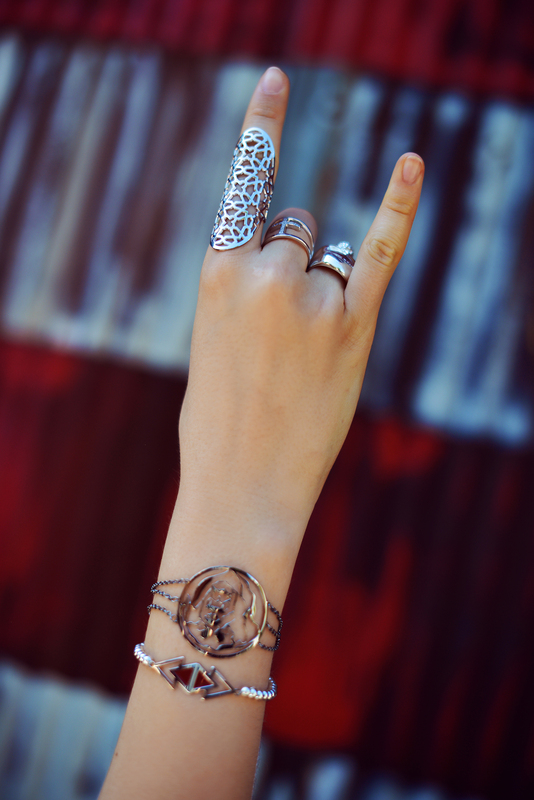 These rings are beautiful, so rock and chic. Your hair is like a dream. Congratulations for your new house, the new adventure and all the new proyect! You look very chic and rock'n'roll! Love this new collaboration you have done. Schöne Fotos. Wild und süss. Nice photos, those jewelrys are beautiful! wow amazing shot! love it! Too perfect! :) Gorgeous session! I love this rock side of you! And these pictures are amazing. Love the crazy vampy hippy vibe from this look! Gorgeous!! Kristina, when are we going to find out what this new project is? Do you have a new clothing line? You look great in the new pics! I'm so used to seeing you looking so elegant so this is something new. OMG you're so beautiful and the photos are amazing (great job james). Love the outside and collection of jewels are amazing ! Nice shirt, perfect accessoires and cool poses - but why is there no picture of the complete look? Would like to see what kind of skirt it is and what kind of shoes you wore with it. Special cool pics! I like the Top *perfection* ! These images are so powerful! I am in the same point of life. I've just started doing things that I have dreamt about all my life, but it feels uncomfortable, strange and difficult for me. On the other hand, I knew it's gonna be hard, I knew that there'll be tears. But I know I need to be hard. These are my dreams that I'm fighting for. Thank you Kristina for this highly motivational text. These pictures are so great! You can feel your hair moving around and the wind blowing just by looking at them! You're gorgeous and the jewelry are super lovely! So excited to hear about your new project ! WOW! That's truly a new side of your character in this pictures! You always inspire with new characteristic. I love this wild and crazy side of you, as the elegant and classy way you usually dress. I love the movement in those photos - they look fantastic! It is sooo different from your usual style !! I like it so much, and the chic touch is perfectly added ! Les photos sont superbes, j'adore leur style un peu rock <3 Très belle collection ! So edgy and awesome! :) I love the shots! Gosh, you're one of a hell talented model! I wish I could pose like than and have this awareness of my body one day. Great photos (as always) - the lightning, movement, styling! Everything is just so damn perfect! Love. These photos are beautiful! I love the cuff. Absolutely loving the spirit and movement in the pictures! Wow! These photos are absolutely stunning! Love the whole look and the jewelry so much! This side of yours is so interesting! Go for your dreams, I'm wishing you the best and I can't wait to hear more about it! Absolutely love the photos! Amazing! Kristina! You are just too lovely and always looking so flawless in each photo! I love the edginess of this outfit and how wonderfully shot each of the photos are! Well, these pictures are absulutely best! Absolutely! Wow you look fierce in these shots! These are some really badass jewelry that admittedly I wouldnt expect you to wear but you're truly owning this look! Congratulations on your new project. You're so strong and fierce in this shoot! Love it. It's like a whole new side to you. Especially love the way you use your hair to spice things up. 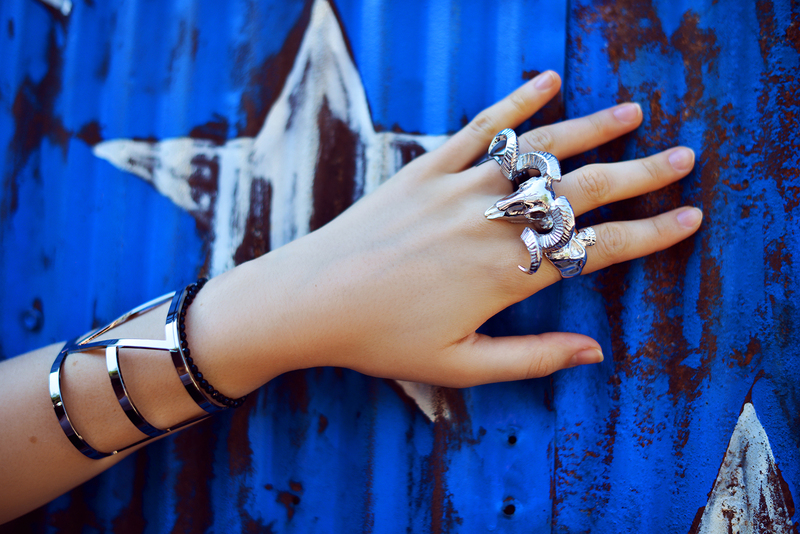 Killer rings! My favorite series within this series! Really cool photos Kay and James! Des photos juste superbes! Jolis bijoux! The campaign looks gorgeous, the photography and stylists have really made it look just incredible. It definitely is a little bit more punk and wild, definitely for me but I bet it was lots of fun to work on and I also love the way that the jewellery stands out. It all fits perfectly. Amazing Jewellery in perfect setting! In love with that lip color!! We never see photos of your closet or your shoe/bag collection? I think one way to get closer to your fans and followers would be to show a more personal side of you. Many other bloggers like Chiarra Ferragni for example, feature their personal wardrobe and stuff. You do it for makeup and skincare products, why don't you also do it for your shoes and clothes? You could do a ''Best purses of my collection'' type of blog post. Amazing jewelry! Can't wait to hear more about your project!!! Awesome post! It's so different and fierce, I love it! I love your bracelet and rings! They add a really cool edge to the outfit. Great photos as always! wow, absolutely stunning pictures. I love the jewelery and the pictures and I love you that you try out new looks and styles. Kristina you look so gorgeous. Love this so much. Wish you a great and productive day in L.A. that all your dreams comes true. Everything about this blog is so put together! Such an inspiration! Amazing Outfit and Amazing pictures! Congrats! The Accessorize are more than just beautiful! Absolutely love the look, especially the rings are amazing! I am totally in love with you right now. I started following you in IG and now I'm following your blog. You're amazing. Wonderful girl ! As always ! Really nice pictures !! loved this shooting. If you see my comment - which is doubtful, please check out this link. You're in it ;-) - It's not my blog, just one I follow, and even though it might seem a little stupid, I got kind of exited to see you're face on one of my other blogs. pour porter tous les jours, je préfère la collection en argent plutôt qu'en or, mais ma couleur préférée pour les bijoux reste le or rosé, que j'aime mixer avec de l'or et de l'argent justement. en tout cas, j'iame beaucoup la collection en argent de ce post.